A lot of writers I speak with think of their book as a story that would make a good movie. It’s nice to think that Stephen Spielberg is waiting in the wings to scoop up your book, but it really doesn’t happen all that often. The movie business is like the book business, only with fewer movies than books. There are a fair number of “option” deals going around, but the real money most often comes with production, not with option. Today I am going to interview John Robert Marlow. 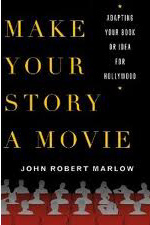 John is the author of Make Your Story a Movie: Adapting Your Book or Idea for Hollywood. He is also the author of Nano, a technothriller that he adapted for film. The script has been honored by the same Academy that hands out the Academy Awards. The Nano script then went into development with a major Hollywood director. John optioned another script to the producer of Collateral, who wanted the script so badly that when she couldn’t reach John herself, she hired a private detective to track him down. John has written numerous articles about writing, self editing and adaptation, both for the Writer’s Digest Books annuals and for his wonderful Self Editing Blog. This interview is going to be in 2 parts. Today we are going to talk about the how Hollywood deals get pitched and put together. The next interview will be about book-screen options and how we move from a book to a screenplay. Andy: John, let’s say you have a novel. How do you determine whether it has any dramatic potential at all? John: Hollywood’s been at this game for a while now, and most of these folks are very clear about what it takes to make a book appealing on the screen. Some of the things that are important to Hollywood mean nothing at all to publishers—so the fact that a book is appealing to publishing houses doesn’t mean it will interest Hollywood. Which is one of the reasons that so few books are seriously considered by filmmakers. At the same time, if you know what Hollywood wants, you can incorporate those elements into your story as you write it, or make sure they’re included in any screenplay adaptation you may write or commission, so it’s never too late. Andy: So what exactly are those elements? John: Hollywood looks for 10 things in any story, fiction or nonfiction: a cinematic concept that can be communicated in ten seconds; a hero that a large segment of the moviegoing public can relate to; strong visual potential; a three-act structure; a two-hour limit; a reasonable budget; low fat (no unnecessary scenes); franchise potential; four-quadrant (young and old, male and female) appeal; and merchandising potential. Seasoned vets with proven track records can sometimes skate the two-hour limit and budget points; newcomers cannot. Franchise and merchandising potential aren’t always necessary but are good to have, particularly at higher budget levels. The same goes for four-quadrant appeal; the more your movie costs, the bigger your audience needs to be to earn that money back. Avatar and Titanic are four-quadrant movies. Andy: What is the first step you take in getting interest from a production company? John: I can pick up the phone or send an email. But for those who don’t have industry connections, it can be hard. The reason is simple: Hollywood, like New York, is full of people trying to sell things that aren’t ready to be seen. Some need a bit more work; others are train wrecks. And then you have the translation issue: some books are movies; most are not. Many could be movies, if carefully adapted—but until you see the adaptation, you don’t really know. There are more buyers for adapted screenplays than for book adaptation rights, so if I really want to get the attention of someone who’s got thousands of other people vying for their time, I’m going to do one of two things—and this applies equally to those with and without industry connections: approach them with a finished screenplay, or put together one hell of a good pitch pack. Whichever path you choose, you must have something professional to show, or there’s nothing to set you apart from the sea of amateurs with little more than an “idea” they think would make a great movie. And while some of those amateurs may be right, you can’t copyright an idea, and no one’s likely to pay you for it. Ideas are common; fabulous execution over the length of a screenplay (or novel, for that matter) is not—which is why New York buys books, Hollywood buys scripts, and no one buys “ideas” from strangers. Andy: Why is it best to have a screenplay? John: Because it’s closer to being a movie—the people looking at it can “see” the movie as they read. That’s vital, because the purpose of a screenplay is to roll a movie in the reader’s head, and to get them to take the next step. If the screenplay is ready to go, the producer can skip a lot of costly and time-consuming development steps and go looking for attachments or buyers right now. Less trouble, fewer headaches, and a faster sale if things go well. If you can’t write a dynamite script, or afford to hire someone else to do it for you, then you’re better off with the pitch pack—because a bad or even mediocre script is a swift path to rejection. There’s too much competition to get by with that. Andy: So what’s a pitch pack? John: The pitch pack is an attempt at a happy medium between raw idea and polished screenplay: unique enough to protect, and hopefully strong enough to generate real interest. It’s similar to a book proposal. It includes a pitch sheet with logline; synopsis or summary; an informal treatment or “scriptment” that’s basically a longer summary with perhaps snippets of dialogue or actual scenes; a bit of info on the major characters; box office figures for similar films already released; a “dream” cast list of the actors you’d want to see in the major roles, a few other things. And you let them know there’s a beatline available on request. If someone bites on that, you follow up with the beatline to demonstrate that you really do know what you’re doing; you’ve mapped out every scene in detail, nothing is vague or conflicting or unresolved. This kind of approach puts you light years ahead of the guy who bangs on Hollywood’s door and says, “Hey, I have a great idea.” It also makes it more likely that, if they do option or buy your pitch, they’ll give you first crack at writing the script—because it’s obvious you’ve worked this out in great detail. I’ll be posting about this on my blog in the near future. Andy: Okay. So you have your script or pitch pack Then what? John: If I didn’t have film industry connections, , I would either look for someone to team with, —someone more familiar with the territory—or go ahead and contact the producers and production companies myself. Keep in mind, though, that if you have a finished script, you can approach reps—meaning agents and managers. . If you find a good one to take you on, they will then approach producers and production companies on your behalf. And they’re likely to get faster, more serious reads from those people than you would, acting on your own. So even if it takes you a while to land a rep, the total time needed to reach your target buyers could still be much shorter. Also, there are some very good reasons to avoid approaching producers or production companies by yourself—not the least of which is overexposure. A good rep—agent or manager—can get your script into the hands of all the right producers in a matter of days. Those producers will not have heard anyone talking trash about your script, because they’ll all get it at pretty much the same time, and they’ll feel pressured to get to it quickly because they know that the rep has also put it in the hands of their competitors, who may be reading it at this very moment. Some low-end producers also do bad things, like “shop” your script to everyone in town, hoping someone, anyone, will bite. This doesn’t help you, and can do quite a bit of damage when you later try to approach those same people with your project—particularly when you don’t know they’ve already seen it. I learned this the hard way. Q: How does the pitch in Hollywood differ from what is expected in book publishing? The Hollywood pitch happens in steps, because no one has time to listen to long pitches or read material that hasn’t been pre-screened or pre-qualified in some way. The first step is the logline, which boils your story down to a 10-second pitch. It sounds ridiculous, but it can be done, and is in fact a sort of art—one I cover in a blog post called Building the Perfect Logline. For example, this is how I would pitch The Fugitive: “A fugitive doctor wrongly convicted of killing his wife struggles to prove his innocence while pursued by a relentless US Marshall.” Or, to pitch a more complex adaptation with multiple protagonists: “A family struggles to escape a remote island park whose main attractions—genetically restored dinosaurs—have been set loose by a power failure.” Which is, of course, Jurassic Park. What you leave out of the pitch is as important as what you put in. An agent or producer can read 700 to 1,000 loglines in the time it takes to read a single script. So, obviously, that’s what they do. If the logline grabs them, they take the next step, and ask for more info or the script itself. If they ask for more info, you give them a synopsis or a pitch sheet teaser, which is the equivalent of a movie trailer in words: your story in one minute. I recently wrote about pitch sheets in a blog post called The One-Minute Story: Crafting a Pitch Sheet for your Book, Screenplay, or Other Tale. If they like the pitch sheet, they’ll usually ask to see the script. In some cases, you can get by with a pitch pack in place of the script. In other cases, not. Without a script, for example, agents and managers have nothing to sell—unless they’re interested in selling the film rights alone, which is less profitable and therefore less attractive from their perspective. Though if you’re brand-name author, this may not apply. This entry was posted on January 2, 2011 at 9:52 am and is filed under Interviews, tips on getting published. You can follow any responses to this entry through the RSS 2.0 feed. You can leave a response, or trackback from your own site. I have just published my fourth book. For the first time I think (and so do many others) that a book of mine would translate into a fine movie (containing the 10 essential elements mentioned by Andy Ross. I have devoured his information re: book into movie. Since I have no experience writing scripts, I believe I would need an agent (rep.). But where to start? How to accomplish contact one? I have written a brief to the point synopsis of my latest book. Should I send this along with the book itself or just the synopsis? Any help on this will be much appreciated. Joseph, I can’t really give any valuable advice about finding a film agent. There are a lot of them and you can usually find them by googling. All I can say is that getting books published is very difficult these days. Getting films produced from books is very very difficult. My name is Tracie Chandler,I like to meet a sceenwriter to adapt my book into a movie. I had written a book a love story tragedy of the early 20th century, The setting is the Philippines a family with so much problems. The lady character finally died in the end amids the tragic of WWll in the backdrop of the story, conflicting is her husband who womanized and her father who was so set up by the tradition.. Pls help me find some hollywood agents for my book. I sent my book to Dreamworld but was returned because DreamWorld would deal only with literary or hollywood agents. I am at a lost who shouldI turn to ., Pls. help me as I am in a hurry to finished my second book as a follow up in that story. Teresita Landin Pls answer me in my e-mail teresitalandin@live.com Waiting. I don’t know if my webpage is still active. Hi Loretta. I’m in the same boat as yourself. I have a novel which is an historical drama and is currently in the Kindle Book Store. You should try maybe putting your book there too, as you can generate some sales and get some interest going as a starters. In the Kindle Amazon store your book is available worldwide. I have had some encouraging sales, not huge but satisfying. I wish I had more advice for you. But you are in a catch 22 situation. You probably need an entertainment agent to do a movie deal. But if you are talking about a film adaptation of your book, you will probably need to have the book represented by a book agent. I wish I had more useful advice than that. Cindy, there is no easy answer for that. If you have an agent for the book, they can give you advice and probably send it to an entertainment agent. Usually a producer notices the book and contacts you about it. Even if it is appropriate for a movie, most of the time it won’t be made into one. If there is interest, a producer might pay for an “option”. Most options expire without film deals. In other words, it’s hard and doesn’t happen all that often. How do i go about getting an agent? I have an animation story that I honestly believe will make whoever makes it a movies rich and famous. It will be as big as The Lion King! How can I get this started before someone steals the Idea? Please contact me. Tim 714 536 2063. The only thing I want to know is why the movie is almost invariably inferior to the book. I watched 5 minutes of a Harry Potter movie on TV and then turned it off. The late Pauline Kael said it was only second-rate books that made great movies. What do you think? Ellen, that’s a good question. Part of it might be that movies need to appeal to 16 year olds to be interesting. Part of it might be that a film script needs to be only 100 pages long, so all books don’t translate well into movies. And sometimes they make pretty good movies. The most recent Anna Karenina adaptation wasn’t at all bad. I have a published book that I think may be a good fit for Oprah Winfrey network or Lifetime. However they will only accept pitches from an agent or production company. How do I find a good agent for the job? Is it as hard to get your book turned over to a movie on one of those type of networks? I also have written a novel which I have been told would make a great movie perhaps with some adjustments here and there. It is currently in the Kindle Amazon book store. The title of my book is “RESNOVIK” and it is an historical drama, along the lines of Dr Zhivago, Gone with the Wind etc where fictional characters are tied into real life situations. It is set in Imperial Russia in the early 20th century and takes in Russia’s war with Japan in 1904 and goes through to the revolution in 1917. It involves war and romance with love triangle. It is a must for any reader who enjoys these sorts of historical dramas.